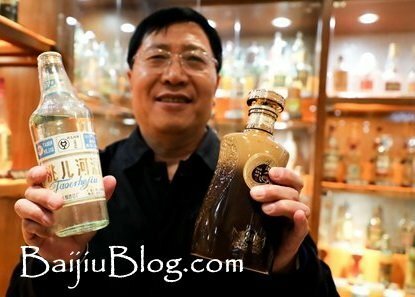 In 2013 a 61 year old collector of baijiu made it into the Guinness World Records book. Ning Fenglian is the chairman at Baishan Fangda a large alcohol distributor in Jilin Provence. Ning started his collection in 1974 and has been adding to his collection ever since. Since childhood Ning says he developed an affinity to Chinese alcoholic drinks which resulted in him working within the alcohol industry. Ning started working in a wine store in the 1990s which was running at a loss but Ning turned the losses into gains through bold and innovative measures. At one time during the 1990s many stores were out of stock of Moutai but Ning had built up good connections with the producers and was able to profit from the shortage by ensuring the empty stores were stocked with Moutai on a regular basis. Since then Nings company has went from strength to strength with over 300 branches across China. Nings entire baijiu collection is on permanent loan to the Jilin Culture Museum which he built in 2014. Ning claims he will never sell his collection as he has invested too much time into researching his rare vintage bottles of baijiu. He has collected and classified almost all rare, vintage and commemorative worthy bottles of baijiu. Nings collecting mania has lead to some family members entering the world of wine collecting, searching for rare vintage wines to appreciate as a family. “Communication not only brings pleasure, but it deepens our friendship, we lose the true meaning of collecting if we keep our collection only to ourselves as a personal treasure,” said Ning, who is also the vice-president of the China National Association for Liquor and Spirits Circulation. In the future he says he plans to organize events for collectors to gather and exchange information. How To Make Baijiu! How Is Chinese Baijiu Made? Baijiu Taste – What Food Goes Well With Baijiu? By what other name is baijiu known as? What is baijiu made of? What is baijius average alcohol content? What is the history of baijiu? How do you pronounce Qu? Baijiu price – How much does it cost? Baijiu brands – Which are the best? What does baijiu taste like? Where can I find baijiu for sale? What foods does baijiu pair with best? How do you drink baijiu? Baijiu cocktails – Do you have any recipes? Welcome to the Baijiu Blog, a website dedicated to all things related to Baijiu, born from the love I have for the Chinese liquor known as Baijiu. This site hopes to answer all of your Baijiu questions such as: How Do I Make Baijiu Cocktails? | What Is Baijiu? | What are the best Baijiu brands? As well as covering topics like Baijiu history, Baijiu cocktails, Baijiu brewing process, Baijiu sorghum use, taste, alcohol content and more.